Forensic botany is the application of plant science to the resolution of legal questions. A plant’s anatomy and its ecological requirements are in some cases species specific and require taxonomic verification; correct interpretation of botanical evidence can give vital information about a crime scene or a suspect or victim. The use of botanical evidence in legal investigations in North America is relatively recent. The first botanical testimony to be heard in a North American court concerned the kidnapping and murder of Charles Lindbergh’s baby boy and the conviction of Bruno Hauptmann in 1935. Today, forensic botany encompasses numerous subdisciplines of plant science, such as plant anatomy, taxonomy, ecology, palynology, and diatomology, and interfaces with other disciplines, e.g., molecular biology, limnology and oceanography. 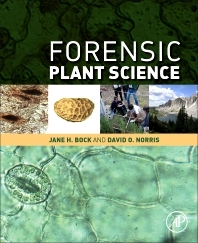 Forensic Plant Science presents chapters on plant science evidence, plant anatomy, plant taxonomic evidence, plant ecology, case studies for all of the above, as well as the educational pathways for the future of forensic plant science. The book’s companion website: http://booksite.elsevier.com/9780128014752, will host a microscopic atlas of common food plants. Forensic scientists, forensic pathologists, forensic science students and educators, attorneys, judges, investigating police officers and private investigators. Dr. Bock is a Professor emerita in biology at the University of Colorado, Boulder. She received her bachelor’s degree from Duke University, master’s degree from Indiana University and Ph.D. (1966) from the University of California at Berkeley. All her degrees are in Botany. She taught, carried out research and published scientific work in population ecology and forensic botany at Boulder for over 30 years. Officially retired from teaching, she continues to do research as a forensic botanist and serve as an expert witness for the defense or the prosecution in homicide cases. She also lectures and continues to publish regularly. She is a Fellow of the American Academy of Forensic Sciences, and was a founding member of both Necrosearch Ltd and the Ecology Section of the Botanical Society of America.